Today we have a saying that goes “you can’t take it with you” about worldly riches and the afterlife. The ancient Egyptians would emphatically disagree with that, their belief was that you could take everything with you that you could cram into a burial chamber: treasures, household items, works of art, carts, boats, livestock, slaves and favorite wives. The latter ones are fortunately not present in Valley of the Kings, but everything that isn’t alive should end up in your tomb to win. Valley of the Kings is a deck-building game, only that unbuilding your deck is just as important as building it in the first place. Allow me to explain. 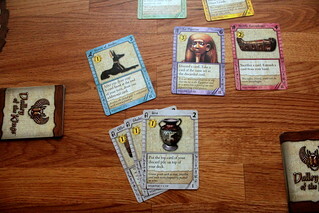 Your deck contains things you acquire in your life in ancient Egypt: statues, amulets, mummified cats – yeah, sorry about that, there was something alive to put in your tomb after all. 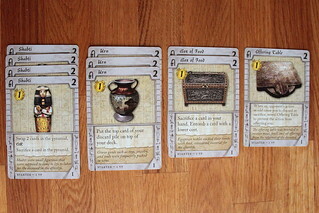 But the only way to score points from those things is to remove them from your deck again and add them to your tomb. From your deck, you draw five cards per round that you can all use in three different ways. There is no action limit like in Dominion, you may always play your full hand. The first, easiest way to use your cards is to buy more cards. There are no currency cards in Valley of the Kings, every card has a gold value and can be used to buy more cards from the Pyramid, that’s the fancy display of available cards. The Pyramid has three rows with three, two and one cards, respectively. You can buy the cards from the Pyramid’s bottom row only, paying their cost by discarding cards from your hand. Don’t worry, like every deck-building game, those cards go to your personal discard pile and you’ll see them again when you shuffle your deck. When you take a card from the Pyramid, it crumbles and the card above the one just taken slides down into the opening, then the card above that slides into that opening. New cards only enter the game at the top of the Pyramid, so you always have some idea what’s coming. You even have some influence over what cards the next player can buy, by selecting which cards you allow to crumble to the bottom. But that’s not a reliable way to keep cards from your opponents, the starting decks contain Shabtis, funeral figurines with the power to swap cards in the Pyramid. Bringing us to the second way to use your cards, playing them for an action. The card actions are mostly less complex than in other deck-building games, but you still have to use them right. A very simple effect you find on the Hopi Canopic Jar, for instance, that lets you discard one card to take the cheapest card from the Pyramid without paying. Or on the Statue of Thoth that changes the gold value of all cards in your hand to four for this round. But more elaborate cards exist as well, like the Censer that lets you take the top card from an opponent’s discard pile for yourself and replace it with the Censer. There are attack cards, as well, that make your opponents discard cards or even sacrifice them. Sacrificed cards go to the Boneyard from where they – usually – don’t return. A few cards can be used in a way that I haven’t encountered in other deck-builders yet, as a reaction to opponents’ actions. The aforementioned Mummified Cat can be played when another player sacrifices a card and lets you take that card to your hand instead. Cards like that give you an increased interest in actually watching other players’ turns instead of just waiting around, you might be able to profit from them. But all those cards are worth nothing while they remain in your deck. Just like the Egyptians considered life to be a chance to collect riches to take to the eternal afterlife, having cards in your deck is only something you need to get cards into your Tomb. 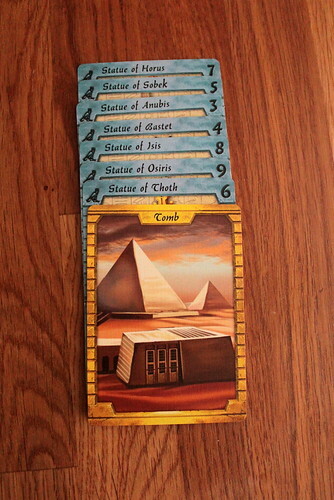 Only cards in your Tomb are worth points at the end of the game. Getting cards into your Tomb is, in theory, very simple. Every round, you may entomb one of your hand cards by putting it under your Tomb card. But once it’s there it will never come back, you lose its gold value and its action. That’s a marked difference from most deck-building games where you only have limited options to take cards from your deck and keeping it small and efficient is a challenge. In Valley of the Kings, you can get rid of cards easily, the tough part is deciding which cards to entomb and when to do it. With the limit of entombing only one card per round, you’ll want to start filling your tomb early, but at the same time you will want to use your more valuable cards as often as you can before you bury them. There are different ways to deal with this. You can try to build a small engine of cards that takes cards and buries them on the same round. There are ways to do that with a deck of only five cards, so once you get it together you can use it every round. Or you can collect cards first, building a bigger deck and then using actions that let you entomb extra cards when the game is about to end, stuffing everything in our tomb at the last minute. Is this a tomb or a museum? The decision what to place in your tomb is made harder by how scoring works. Some cards, including your starter cards, have a fixed point value. But the big points come from sets, because a set is worth the number of different cards from that set in your tomb squared. If you manage bury six statues, that’s 36 points already. You’d need a lot of single cards to get there. There are a different number of cards in each set, giving each set a different potential value. Oh, and the contents of your tomb are public knowledge, so don’t expect them to give you the final cards of a large set without a fight. Valley of the Kings is a very focused game, it only has a few mechanics and the whole game is build around them. All you want are cards in your tomb, and there’s really only one way to get them there. There are different strategies to bury as many cards as possible, but you do end up doing the same general thing a lot. It doesn’t have the same staying power as, for example, Dominion, where you play every game with a different set of cards. On the other hand, Valley offers a completely different challenge from other deck-builders, it needs an all new approach to deck management. Through the set-based scoring and the reaction type cards, you also get more interaction than in other deck-builders, with more focus on keeping cards away from other players to prevent them from scoring. Valley of the Kings is not a top tier deck building game, but it is still a good game that will give you an interesting change of pace from other deck-builders.